Sadly, for many years, the phrases ‘recycled materials’, and ‘deeply desirable accessory’ had rarely been comfortable conceptual bed-fellows. Arguably, most accessories, in particular bags, developed from recycled raw materials tended to have achieved an emphasis on ethics, with aesthetics taking a back foot. It seems times are a’ changing. A new generation of bags and accessories are available, and rapidly growing in popularity and desirability that are so damn good, that many consumers are even snapping them up based on looks and functionality alone, unawares of their do-goodly ways! So what is it about their concept and products that seem so relevant and why are they currently being embraced with such fervour? The irony is that, within two very prominent European players at least, the solution to this previous apparent anathema of appealing design versus ethical sourcing was actually solved outside of the fashion industry within which they now enjoy well-earned success. Fifteen years ago Swiss brothers Markus and Daniel Freitag, both graphic designers, struggling to find a durable, water resistant and cycling proof bag in which to carry their work, took matters into their own hands. The resulting creation was a messenger bag fashioned from an old truck tarp, seat belts for straps and used a spare bicycle inner tube to keep the edges from fraying. Unintentionally landing a hit, this basic formula has proved the basis for most of their subsequent forty plus products that are now sold globally. 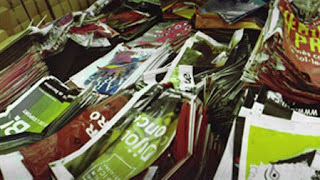 In a similar vein, eight years ago a group consisting of two graphic designers and two industrial designers started the brand Vaho Works in Barcelona, Spain, utilising the ubiquitous PVC advertising banners that line the streets in this city and it’s metropolitan area (and later from Madrid and Seville). Often beautiful and vibrant advertising banners for music, sporting and cultural events and art exhibitions are given a second life, through securing relations with institutions, museums, municipalities and private companies. 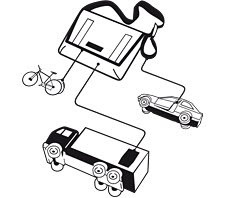 They have also developed another range of messenger bags reusing old tires. They currently have two stores in Barcelona and one in Osaka, and sell through many other retailers. Vaho Works and Freitag have inspired a proliferation of copies, some of which sadly adopt only the design aesthetic and not the reuse of otherwise landfill-bound materials. One positive message that can be drawn from this is: if these ethical products are worth copying, it is because their success and relevance is on the rise. Cynics could argue that products produced from reused material is merely a trend, and that their success, as opposed to previous attempts, is due to the fact that finally some people have come up with appealing and wearable designs. But the facts that the ages of these companies are now into or nearing double figures, and that their sales continue to grow, show that this is not a flash-in-the-pan trend that appeals solely to a design clique. Matters of depleting global resources, unsustainable levels of rubbish dumping into land and sea as well as irrevocable environmental damage and pollution created by production are not issues that are going away. They will continue to be at the forefront of much social and political discourse from here on in. Increasingly the world is waking up to the fact that such problems need to be addressed on many levels, from the actions of global corporations, government and inter-governmental policies at the top of the food chain, to the everyday choices made by all citizens of the globe. To put it bluntly, is these companies are merely cashing in on a trend, then maybe buying shares in these companies wouldn’t be such a crazy idea! So who are these products appealing to, and in conjunction, what of their future? Freitag and Vaho Works, though similar in concept, do not represent significant threats to one another. For one thing, their price points are very different. Also the comparatively subtler and more mature products of Freitag contrast somewhat with the bright youth-friendly ‘Trashion’ from Vaho Work’s factory. Interestingly, both ranges include items specifically aimed at either men or women, but the majority of styles are relatively androgynous. 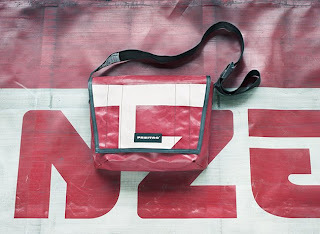 I recently heard of a gentleman, through a Freitag-fan friend of mine, that bought a Freitag bag some ten years ago, and due to it’s durability is still sporting it around town. Until my friend began to open a discussion on the company, he had been completely unaware of Freitag’s ethical background and his subsequent involvement in such affairs. So these items do not only appeal to the ethically minded, although, for reasons previously noted, this group is set to grow in number. So with consumer profiles ever expanding, the companies themselves must do so. A whole fifteen years after the initial messenger bag, Freitag’s range now includes laptop holders, luggage and footballs. Vaho Works’ includes mobile phone holders, wallets and seating. Both companies spheres’ of influence are on the rise, from collaborating with different creative disciplines to involvement in further community based recycling projects. Both companies also encourage consumer participation in the designing of items. Inevitably, the number of such companies and brands will grow. This will reflect the growing uses of existing recyclable materials, as well as an increase in the number of materials able to be reused, and the altered manufacturing methods that maybe needed to rework these materials. Exciting and innovative times lay ahead for the fashion industry and others, all we need to do is have another look around us. Plus one kind of cheat where I facilitated the purchasing of a new garment for me as a birthday gift, resulting in one cute-as-a-button coat from Bershka via Lee and Isi. Now in my opinion gifts are a bit of a grey area in the rules of my Wardrobe Refashion pledge, but even if the coat does have to be counted, I still came in within my allotted ‘new garment’ allowance. Another loophole in the pledge is the allowing new socks and underwear purchases, which starved of normal garment consumption, has for me taken on something of a guilty pleasure, resulting in the acquisition of more socks and pants than I’d like to admit. Now, whilst the three new garment purchases I made last year were not manufactured in China, the coat and many of the pants were. One day I will go into my personally boycotting of Chinese goods as I fear I will lose your attention if I go into this here. But, even though the particular garments were not manufactured in China, Zara (I cannot comment on Lee without research that I am too lazy to undertake) does produce some of its garments China. Is that ok? Am I still condoning manufacture in China? I’m confused! Too many grey areas! These are my rules that I have chosen to implement, but they are opening up so many sub-questions. What are my exact standpoints on these? I am at risk of breaking my brain trying to figure them out. So I have decided: Enough! I have embraced 2009 as the year in which I purchase NO NEW GARMS! Even pants and socks.